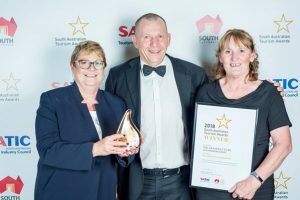 For the fifth consecutive year, luxury Riverland accommodation, The Frames, has been named as winner of the Self Contained Accommodation category at the South Australian Tourism Awards after being inducted into the Hall of Fame in 2017. The awards night was held in Adelaide on the 9th November and recognises the State’s best tourism businesses, experiences and individuals. “We wish to thank everyone for their continued support, especially our guests who we love providing a private and secluded space to relax and reconnect and we look forward to representing South Australia again at the Qantas Australian Tourism Awards in 2018” says Cathy Edmonds, proprietor of the luxury accommodation in the Riverland. 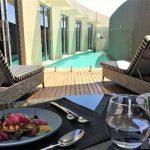 The Frames Retreats are in the truest sense – world-class luxury accommodation, designed for couples and built for discerning travellers wanting the experience of world-class luxury and personal hospitality. They are popular with couples seeking a romantic location to celebrate anniversaries and honeymoons and for destination proposals. The Frames are recognised for their commitment to providing a unique accommodation experience that can be tailored to include a range of personalised tours. Guests have the opportunity to explore the Murray River and encounter wildlife with a range of cruises, and taste the Riverland with exclusive tours of local breweries, distilleries and wineries. The three completely private retreats are located in Paringa and overlook the Murray River. Each one is different but all have the same in level of luxury and resort-like features such as a heated pool, spa and sauna, but in a space that is your own. Guests of The Frames continually give high praise for the attention to detail and acknowledge how staff go ‘above and beyond’ to make their time at the luxury accommodation extra special. Establishing world-class luxury lodge accommodation in the Riverland has opened this spectacular region to domestic and international visitors, helping to raise awareness of the Murray River. It has also introduced guests to the ever emerging boutique wine and craft produce culture in South Australia’s “food bowl” region. The Qantas Australian Tourism Awards will be held in Tasmania, March 2019 and Rick and Cathy Edmonds are proud to be representing South Australia and the Riverland at the event. For more details and to request high res-images contact cathy@theframes.com.au Alternatively, images can be accessed here Cathy & Rick Edmonds, Proprietors The Frames.